This information was sourced from internet. We advise to do further reserach yourself, our advise is shared advice meant to provide helpful information only, we are not medically trained. Mould : Deter your dog from eating mouldy food. especially when out and about walking. Mould can be dangerous and can be fatal. Common signs that your dog has eaten mold include: Vomiting, Diarrhea,Muscle tremors, Seizures, Elevatd body temperature. Symptoms can last up to 48 hrs and can be life threatening if left untreated. 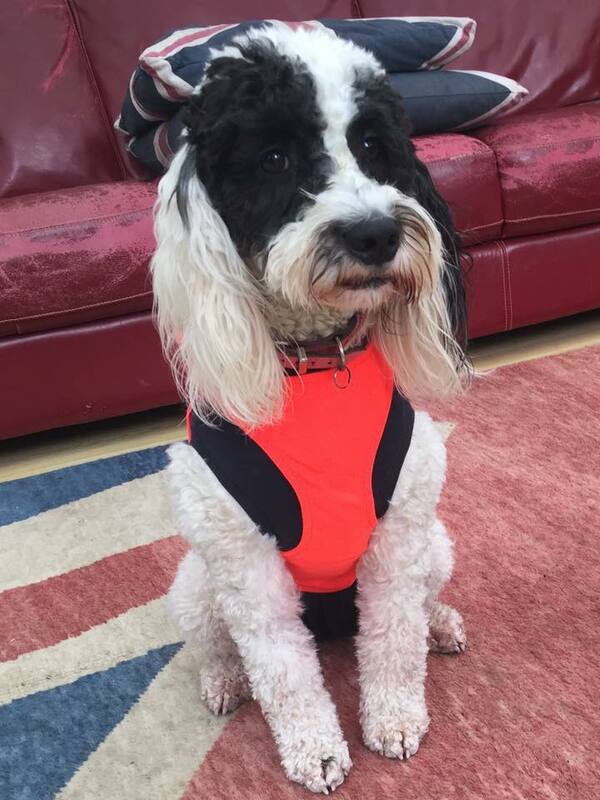 Sadly one of our club members Cockapoo ( Dexter) sadly lost his life after eating mouldy bread that had fallen out from a recycling food bin the wind had blown over. Their other cockapoo had also eaten some and was poorly but survived. Also be aware of bread being left out for birds, often people throw whole slices out which can turn mouldy. Chocolate: Chocolate contains theobromine, a toxic agent that can cause vomiting, diarrhoea and heart rhythm disorders. Large quantities can lead to death. The worst chocolate contains the higher percentage of coco beans used and cooking chocolate. Coffee and tea and cola and stimulant drinks: The caffeine and theophylline found in these types of drinks can lead to restlessness, heart palpitations and tremors. Alcohol: Can effect dogs like humans but will have an effect much quicker. This can cause vomiting, diarrhoea, loss of co-ordination, depression and if ingested in large quantities coma and death. Onions and Garlic: These contain sulfoxides and disulphides which affect the red blood cells and can cause anaemia, as well as weakness and vomiting. However Garlic is less dangerous in small quantities and does have health benefits and is used in small quantities in food and as natural flea prevention by many. Mushrooms: Some species can be fatal. So be careful when walking out and about, especially wild mushrooms or if you are visiting other cuntries. All the Amanita species are toxic and they lead to liver and neurological disorders. Symptoms are vomiting, diarrhoea and excessive saliva and seizures. If dogs have eaten then take straight to the vet. Grapes and Raisins: Can lead to kidney failure. Raisins are more concentrated.If you dog has injested contact vet. The normally will induce sickness, give charcoal tablets, they may keep dog in and monitor, or do further investigations i.e blood tests. Peaches and Plums and cherries: Their seeds can cause intestinal obstructions and the pits contain cyanide which is toxic. Apples: Apples are fine to give but do not give pips as they contain cyanide which is toxic to dogs if consumed in large quantities. Xylitol found in things like sugar free sweets/mints/gum and some peanut butters: Xylitol causes hypoglycaemia and liver failure and can be fatal. The first symptoms are vomiting, lethargy and loss of co-ordination. Check labels of products before buying. Salt: Too much salt is bad for your dog causing vomiting, tremors and diarrhoea. Symptoms would be excessive thirst and urination. Yeast Dough: Can expand and produce gas in the digestive system which is painful and can cause rupture of stomach and intestines. Cooked bones: Can cause blockages and intestinal punctures. Symptoms are severe pain and vomiting. Corn cobs and popcorn: Can cause intestinal blockages. Symptoms are severe pain and vomiting. Potato green sprouts: Don't feed RAW potatoes that are sprouting. They contain Solanum Alkaloid which is poisonous to both dogs and humans. Hops: Hops can cause an increase in heart rate and temperature, seizures and death. Tomato plants and stems, Rhubarb leaves: These contain Oxalates which can affect the digestive, nervous and urinary systems. Liver: Feeding large amounts of liver can result in Vitamin A toxicity which can affect muscles and bones. Always feed in moderation. If you dog has eaten any of the above then please seek advice from your vet without delay. The most serious signs are only seen if the dog has eaten a large amount but the LD50 (dose at which 50% of animals will die) for dogs is 15g of Daffodil bulbs, which is not a lot. The toxins contained in Daffodils are alkaloids including galanthamine and lycorine and there is no specific antidote. A 24hr help line run by vet poison specialists , who may be able to advise/help. This is a charged service, please read their info before ringing them. 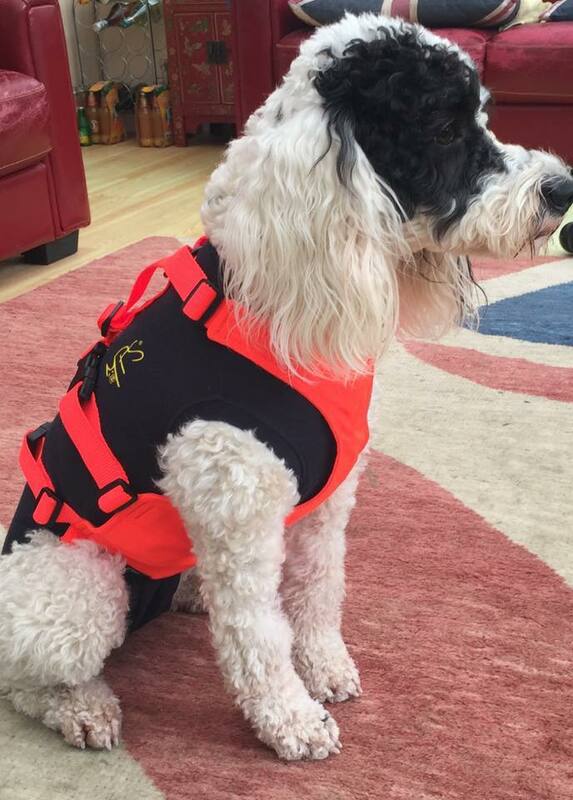 A lot of dogs love to swim but sensible precautions should be observed. Never ignore any warning signs about or prohibitive notices. Some lakes may look OK but you may not know how deep the actually are and your dog could get into trouble and possibly drown. Another danger is the Blue/green Algae. This forms on top of the lake and can make them look oily and cloudy with a scum. Check the lakes you use for signs to see if they have blue/green algae. Be cautious about going into unfamiliar waters as they may be contaminated by chemicals. Parks etc… may use them to control algae. Others may be near farm lands and may contain fertilisers and pesticides. Dogs can become ill from ingesting the chemicals and can cause skin irritations. Always towel off your dog and give it a bath as soon as you get home after it has been swimming to ensure its coat is free of anything picked up from the water. Especially make sure ears are dried properly as they can become a breeding ground for bacteria and yeast to grow. 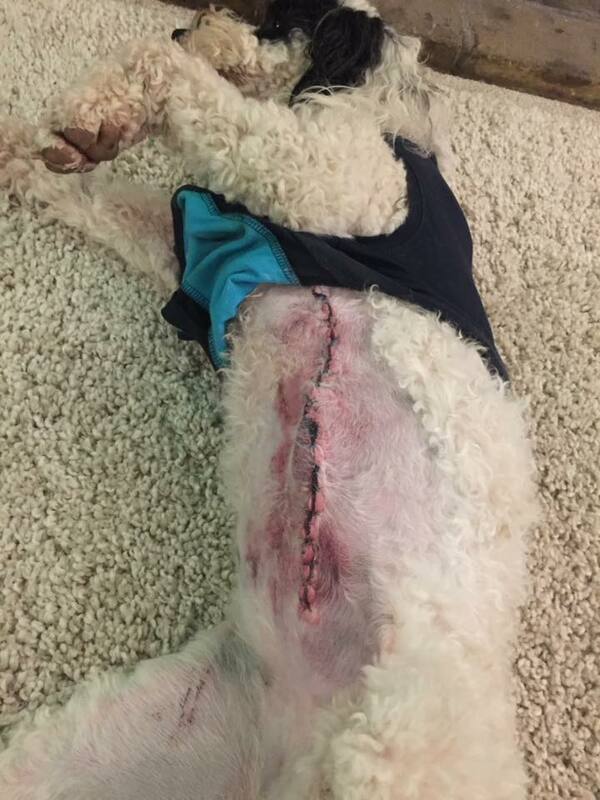 One of our members cockapoo Patches has an unfortunate incident in the woods where she ripped open her chest and tummy. She is recovering well, her owner wanted to raise awareness and has also made safeguards for the future, by investing in a skid plate guard. You may find them available on gun dog websites , Amazon or a UK supplier such as http://www.dogtrainingsupplies.co.uk/skid-plate.html. Please note we have no affiliation to this company, just sharing useful info. We cannot guarantee stock levels etc...as have no connection to supplier.